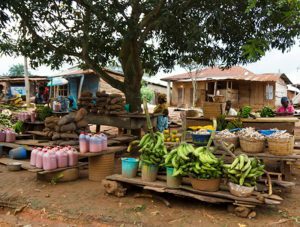 Minigrids represent a $20 billion business opportunity in Nigeria and a chance to improve the lives of over half the population that remain without electricity, according to a report released today. Prepared by the Rocky Mountain Institute and the Nigerian Economic Summit Group, the report focuses on how lack of electricity impedes business development in the West Africa nation of 186 million people — and how minigrids can change that. Policy, technology and market forces are beginning to drive development of Nigerian minigrids – the term Africans use for microgrids, in this case those up to 1 MW that have multiple customers. Only 45 percent of Nigeria’s population has access to electricity, a staggering statistic 136 years after the invention of the light bulb. But even worse, the number drops to 36 percent for those in rural areas. Because it’s expensive to extend grid connections to remote regions, rural businesses tend to rely on diesel and oil generators. But this too is pricey at roughly 70 cents/kWh. Nigerian minigrids are less expensive at about 57 cents/kWh but cost more than a central grid connection, which is roughly 14 cents/kWh. However, the gap is likely to narrow soon, according to the report. The report foresees minigrid costs dropping by as much as 60 percent by 2020 as they shed the risk and uncertainty associated with a nascent market. Already, minigrids are becoming commercially viable, moving away from grant or government support in Nigeria. Electricity in Nigeria is not only pricey, but also spotty. Over 80 percent of Nigerian business owners cite electrification challenges as their most significant obstacle, according to the report. This isn’t surprising, considering that they experience an average of 239 hours without power each month. This erratic power supply creates an annual economic loss that exceeds $25 billion, according to the report. “Additionally, unreliable power supply creates social challenges such as lack of access to food, potable water, lighting, healthcare, education, information, and other basic amenities,” the report said. Although minigrids produce reliable energy they remain a small part of Nigeria’s energy mix. Only about 30 solar minigrids exist in Nigeria, serving about 6,000 people with a total capacity of 1 MW, according to data that the report cites from Deutsche Gesellschaft für Internationale Zusammenarbeit. Most are in agricultural communities with around 2,500 people. 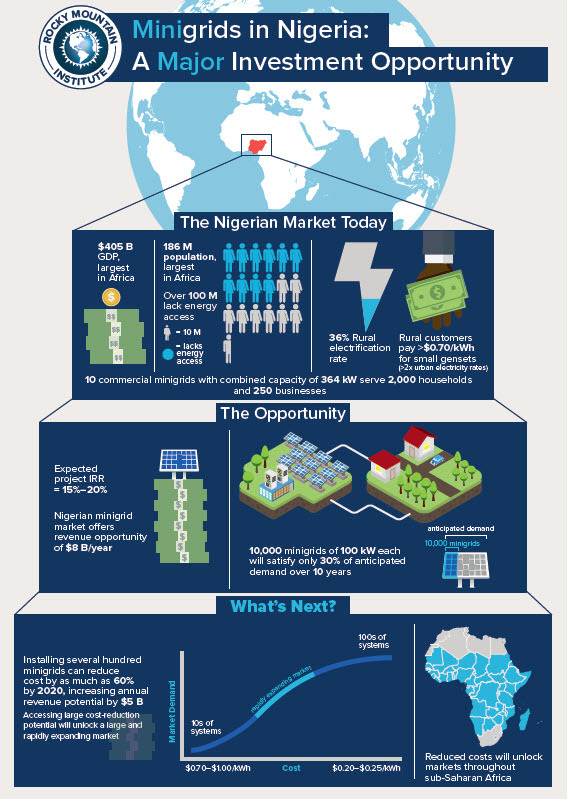 Scaling the Nigerian minigrid market to 10,000 sites, each with a 100-kW capacity, would power 14 percent of the nation’s population, creating a $20 billion investment opportunity, according to the report. Minigrid developers report 15-20 percent returns on successful projects, according to the report. The report profiles 10 existing mini-grids, all powered solely by solar and storage except one that includes diesel. China and European vendors provided the equipment for them. The 10 minigrids tend to use an owner/operator business model funded through a mix of debt, equity, and grants. They typically charge a fixed tariff rate. The majority of residents say the minigrid power costs them less than energy alternatives they used beforehand. To unlock the Nigeria’s minigrid market — a potential $8 billion annual revenue producer — the report recommends several best practices. For policymakers these include eliminating duties and fees on renewable energy technology, clarifying regulations and streamlining permitting. Businesses can help by setting up a consortium for bulk procurement, creating standards, and improving telecommunications. Investors could create a minigrid finance consortium with designated investors responsible for specific projects stages. Developers could seek cost-reduction strategies, such as clustering sites to reduce the expense of labor and operations and maintenance. Track news about minigrids by subscribing to the free Microgrid Knowledge newsletter. Or follow us on Twitter @MicrogridNews . Whether it’s California, Florida, Puerto Rico or Nigeria an entrepreneur in Kansas has the best and most appropriate and cost effective technology for adding locally available energy derived from biomass or wastes to alternating or DC minigrids. This offers free energy storage and dependable backup for both solar and wind energy which are intermittent sources. Email LBlevins@aaecorp.com for more info. So how can utilities continue to fulfill their service reliability obligations of today, while also integrating the distributed energy and up-and-coming technologies of tomorrow? 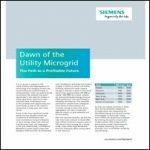 Download the new white paper from Siemens and learn more about how today’s utilities are beginning to prepare by entering discussions around grid modernization, DER compensation, and business model transformation, by sharply enhancing core utility priorities, such as reliability, resiliency, and efficiency.